The phenomenon of the swelling phone battery. Perhaps you have noticed that your smartphone is running hot, getting shorter battery life, or even switching off altogether? ... Time to inspect your battery! In most android phones and windows based phones this will be as easy as sliding or unclipping the back of the phone. If you own an iphone however, then inspecting the battery is out of the question as the battery is integrated inside the phone and is generally not user replaceable. (What a clever way to incorporate limited service life). 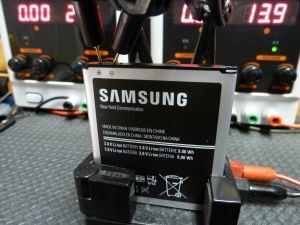 In terms of battery issues, one of the most common issues we see these days is the phenomenon of swelling batteries. Upon removing the battery cover, many people discover to their horror that their battery appears to be “swelled, pillowed, ballooned or bulged” . Sometimes the swelling is slight, sometimes very pronounced. In severe cases, due to the increased size of the battery, it is impossible to fit the cover back onto the phone. Even more serious is the issue of corrosive electrolyte leaking out of the battery and into the battery compartment, and subsequently into the phone due to the internal cell membrane having ruptured. If you are unsure if the battery is “swelling” place the battery on a flat hard surface and see if it will spin. If it does, then there is some degree of swelling. Although the phenomenon seems more common in Samsung Galaxy Smart phones (possibly due to higher sales) , other manufacturers are experiencing this issue also. Some batteries go for years before a problem arises and others last just a few months.The majority it seems are batteries that have been in service for a while. Battery analysis reveals how bad things can get. In the above results, a swollen battery was put through two charge-discharge cycles. Effectively, there is no energy absorbsion during charge mode. The cell voltage peaks at around 4.2v but almost immediately drops to a critical low when placed under load due to it`s inability to absorb charge in the first place. This poor battery was only able to deliver 0.4% of it`s rated capacity! Not nearly enough even to boot the phone up. Some known characteristics of Li-ion batteries may help in understanding why this happens so commonly. Lithium ion (Li-ion) batteries are voltage sensitive (voltage limited) devices. This is for good reason. 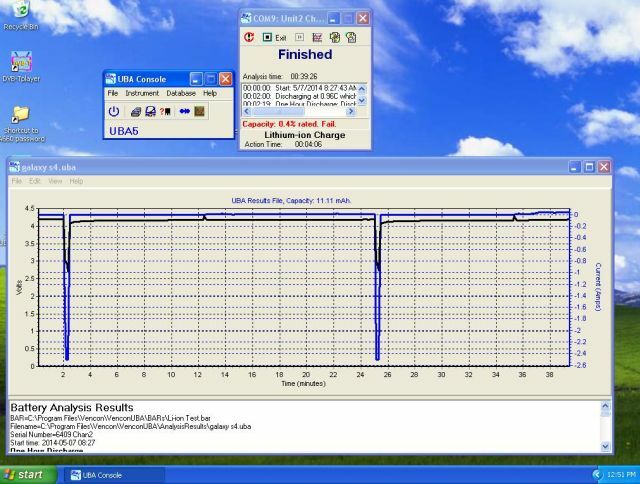 Even slightly raised charging voltages can play havoc with them and as such, voltage to the cell must be controlled accurately. However there is an advantage in applying elevated charge voltage, and that is longer runtime between charges. It is after all what consumers want - a phone with the longest possible battery life, and manufacturers are trying to oblige. The typical Li-ion phone battery is just one cell. Most are rated between 3.7v – 3.8v. A cut-off voltage of 4.2 is typically applied in charging. When this cut-off voltage is reached, the battery is actually only about 85% charged and requires a period of “trickle” to fully saturate the battery to 100%. While it is advantageous to the consumer to have longer run time by fully saturating the battery, at the same time, if this process is not controlled, or extended too long, the battery can be stressed, total service life is reduced and battery safety can be compromised. While slightly elevated charge voltage is often not a problem in the laboratory, the real world is often not so kind. Charging in a hot environment for example can exacerbate problems, increasing internal cell pressure, and increasing the likelihood of swelling. Whilst it is safer, and more reliable to apply lower voltage during charge, the battery will not reach full saturation resulting in shorter service between charges. This is the dilemma for the charging circuit designer. Produce phones with longer battery service but less reliability, or shorter battery service but better reliability. Battery age also seems to play a part. As the battery ages and cycles more times during it`s life, so too does it`s internal chemical efficiency and it`s ability to accept energy diminish. As charge absorbsion decreases, the input energy is most often then converted to heat and is dissipated by the battery itself by becoming hot. Internal gassing, increased cell pressure leading to swelling is often the result. What can I do to prolong my phone`s battery? *Avoid charging your phone in hot or extremely cold environments if possible. *Avoid leaving your phone on charge unnecessarily for extended periods. Although the batteries themselves contain various protection circuits, and the phone`s charging circuit controls charge application, still it is wise and just plain common sense to unplug your phone from the charger when the phone indicates charging is complete. Overcharging may still be possible on certain phones; (phones that continue to apply trickle charge after main charge is complete) if left connected to the charger endlessly. *Turn your phone off during charge. This will allow your phone to reach the correct end point voltage more easily without loading the battery up and confusing the phones charging algorithm. *Disconnect the charger if the battery is getting hot. * If storage is necessary, store at approximately 50-70% charged. Do not store batteries in a discharged state. But most importantly, if your battery has succumbed to the phenomenon of swelling, stop charging it and replace it as soon as possible. Continuing to charge a battery in this state is very risky indeed. New batteries for all makes and models are available from our website.